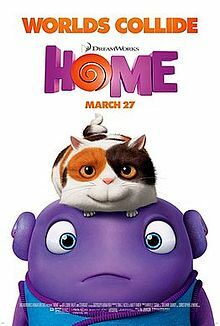 ^ Lorne Balfe Scoring DreamWorks Animation’s ‘Home’. Film Music Reporter. November 24, 2014 [January 7, 2015]. ^ HOME 2D (U). 英国电影评级协会. February 18, 2015 [February 18, 2015]. ^ 3.0 3.1 《疯狂外星人》更多资料. 时光网. [2015年4月3日]. ^ 4.0 4.1 4.2 Home (2015). Box Office Mojo. Amazon.com. [April 2, 2015]. ^ DreamWorks Animation SKG Management Discusses Q3 2013 Results - Earnings Call Transcript. Seeking Alpha. October 29, 2013 [October 30, 2013]. Home is an outrageously funny buddy movie about a hilarious, yet inept, alien race and their equally inept invasion of Earth. ^ 美国梦工场3D动画片 《HOME》确定引进. 深圳新闻网. [2015年4月3日]. ^ 7.0 7.1 《疯狂外星人》定档4月24 谢耳朵蕾哈娜"处女配". 新华网. 2015年3月16日 [2015年4月3日]. ^ 8.0 8.1 Intergalactic Memo - Subject: Steve Martin and Jennifer Lopez. PR Newswire. October 4, 2013 [October 4, 2013]. ^ Graser, Marc. Rihanna to Make Concept Album for Upcoming Animated Movie. Variety. February 25, 2014 [February 26, 2014]. ^ DreamWorks Animation SKG Management Discusses Q3 2013 Results - Earnings Call Transcript. Seeking Alpha. October 29, 2013 [February 26, 2014]. Together with her world-class songwriting creative team, Rihanna has been collaborating with us for over the last 2 years to create an innovative musical movie event that features an entire concept album of brand-new songs and we couldn't be more excited about it. ^ Ellwood, Gregory. Jeffery Katzenberg. HitFix. May 21, 2014 [May 30, 2014]. ^ Johnson, Ted. Obama Tours DreamWorks Animation, Visits With Steve Martin and Jim Parsons. Variety. November 26, 2013 [February 8, 2014]. ^ Herreras, Mari. T Q&A Adam Rex. Tucson Weekly. September 23, 2010 [February 2, 2012]. ^ Rex, Adam. @delzey Yes, Dreamworks optioned SMEKDAY 3 yrs. ago, and renewed the option this year. If they make it I expect it'll be CGI. #kidlitchat. MrAdamRex. Twitter. November 16, 2011 [February 2, 2012]. ^ Jim Parsons and Rihanna to Voice DreamWorks Animation's Happy Smekday!. DreamWorks Animation. ComingSoon.net. June 20, 2012 [June 20, 2012]. ^ DreamWorks Animation. New Distributor Twentieth Century Fox Unveils DreamWorks Animation's Release Slate Through 2016. DreamWorks Animation. September 9, 2012 [September 10, 2012]. ^ Movie Title Changes. Box Office Mojo. [June 16, 2013]. ^ DreamWorks Animation Moves Up 'Penguins Of Madagascar' Bow, Bumps 'Home' To 2015. Deadline.com. 2014-05-20 [2014-05-20]. ^ Home. Rotten Tomatoes. [2015-03-30]. ^ 臺北周末電影票房(3/27-3/29) 分歧者2蟬聯冠軍 好家在一起逗趣吸睛. Yes娛樂. 2015-03-31 [2015-04-05]. （原始内容存档于2015-04-10）.